« Will Denmark Become a Shining Example of Mitchell’s Golden Rule? When I wrote the other day that the Organization for Economic Cooperation and Development was the worst international bureaucracy, I must have caused some envy at the International Monetary Fund. And they may be right. The IMF has published some new research on inequality and growth that merits our attention. I hoped it would be a good contribution to the discussion, but I was disappointed (albeit not overly surprised) to see that the authors put ideology over analysis. Widening income inequality is the defining challenge of our time. …Equality, like fairness, is an important value. Needless to say, they never explain why inequality is a more important challenge than anemic growth. Moreover, they never differentiate between bad Greek-style inequality that is caused by cronyism and good Hong Kong-style inequality that is caused by some people getting richer faster than other people getting richer in a free market. And they certainly don’t define “fairness” in an adequate fashion. But let’s not get hung up on the rhetoric. The most newsworthy part of the study is that these IMF bureaucrats produced numbers ostensibly showing that growth improves if more income goes to those at the bottom 20 percent. …we find an inverse relationship between the income share accruing to the rich (top 20 percent) and economic growth. If the income share of the top 20 percent increases by 1 percentage point, GDP growth is actually 0.08 percentage point lower in the following five years, suggesting that the benefits do not trickle down. Instead, a similar increase in the income share of the bottom 20 percent (the poor) is associated with 0.38 percentage point higher growth. And this correlation leads them to make a very bold assertion. …there does not need to be a stark efficiency-equity tradeoff. Redistribution through the tax and transfer system is found to be positively related to growth for most countries. Followed by some policy suggestions for more class-warfare tax policy to finance additional redistribution. …the redistributive role of fiscal policy could be reinforced by greater reliance on wealth and property taxes, more progressive income taxation… In addition, reducing tax expenditures that benefit high-income groups most and removing tax relief—such as reduced taxation of capital gains, stock options, and carried interest—would increase equity. Those are some bold leaps in logic that the authors make. And we’ll look at some new, high-quality research on the efficiency-equity tradeoff below, but first let’s consider the IMF’s supposed empirical findings on growth and income. Did they cherry pick the data? Why look at the relationship between growth and income gains in the previous five years rather than one year, three years, or ten years? Why do they assume the correlation they found in the five-year data somehow implies causation for future growth? Roosters crow before the sun comes up, after all, but they don’t cause sunrises. Was there any attempt to look at other hypotheses? One thing that instantly came to my mind was the possibility that recessions often are preceded by easy-money policies that create asset bubbles. And since those asset bubbles tend to artificially enrich savers and investors with higher incomes, perhaps that explains the correlation in the IMF’s data. Perhaps most important, why assume that faster income growth for the bottom 20 percent automatically means there should be more redistribution through the tax and transfer system? Maybe that income growth is the natural – and desirable – outcome of good Hong Kong-type policies? There are all sorts of other questions that could and should be asked, but let’s now shift to the IMF’s bold assertion that their ostensible correlation somehow proves that there’s no tradeoff between growth (efficiency) and redistribution (equity). Kevin Hassett of the American Enterprise Institute investigated the degree to which Arthur Okun was right about a tradeoff between growth and redistribution. Forty years ago, the economist Arthur Okun wrote a seminal book with a self-explanatory title: Equality and Efficiency: The Big Tradeoff. …Okun’s tradeoff seems to be forgotten by many on the left, who advocate expanded government spending at every turn… What is needed is some kind of controlled experiment.. When the financial crisis began, countries varied tremendously in the extent to which they redistributed income. Some, such as Ireland and Sweden, redistributed a lot; others, such as the U.S. and Switzerland, not so much. Now, seven years later, some countries have recovered smartly. Others have not. If we go back and sort countries by how much they redistributed before the crisis, how does the growth experience compare? …The vertical axis plots how much redistribution there was in each country in 2008. The horizontal axis plots the rate of per capita national-income growth that each country averaged during the four years between 2008 and 2012. In some sense, then, the chart asks the question, “To what extent does variation in the size of the welfare state in 2008 explain variation in how economies recovered from the crisis between 2008 and 2012?” …As one can see in the chart, …the data show a clear pattern: the heavy redistributors have done much worse. And here’s Kevin’s chart, and it clearly shows the redistribution-oriented nations had relatively slow growth (the top left of the chart). The bottom line is that Kevin’s hypothesis and data are much more compelling that the junky analysis from the IMF. But you don’t need to be an expert in economic jargon or statistical analysis to reach that conclusion. Just look around the globe. The real-world evidence is so strong that only an international bureaucrat could miss it. The nations that follow the IMF’s advice, with lots of redistribution and class-warfare taxation, are the ones that languish. After all, Greece, Italy, and France are not exactly role models. While jurisdictions such as Hong Kong and Singapore routinely set the standard for growth. And nations with medium-sized welfare states, such as Switzerland, Australia, and the United States, tend to fall in the middle. We out-perform Europe’s big-government economies, but we lag behind the small-government economies. Let’s close by looking at some additional findings from the IMF study. I was actually surprised to see that the bureaucrats admitted that inequality (more properly defined as some people getting richer faster than others get richer) was the natural result of positive economic developments. We find that less-regulated labor markets, financial deepening, and technological progress largely explain the rise in market income inequality in our full sample over the last 30 years. So why, then, is “inequality” a “defining challenge”? Needless to say, the IMF never gives us a good answer. I also was struck by this passage from the IMF study. Figure 18 indicates that rising pre-tax income concentration at the top of the distribution in many advanced economies has also coincided with declining top marginal tax rates (from 59 percent in 1980 to 30 percent in 2009). 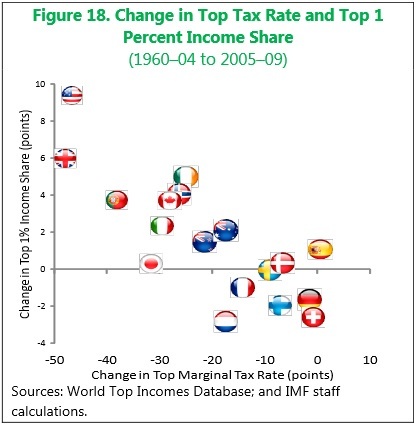 And here is the chart, which the IMF would like you to believe is evidence that lower tax rates have contributed to inequality (even though the bureaucrats already admitted that natural forces have led some to get richer faster than others). Yet this chart simply shows that supply-siders were right. Reagan, Kemp, and other tax cutters argued that lower tax rates would lead rich people to earn – and declare – more taxable income. Heck, I’ve already shared incredibly powerful data from the IRS on this occurring during the 1980s in the United States, so it’s no surprise it happened in other nations as well. But I don’t want to be reflexively critical of the IMF. The study did have some useful data. And there was even one very good recommendation for helping the poor by cutting back on misguided anti-money laundering laws. Country experiences also suggest that policies such as granting exemptions from onerous documentation requirements, requiring banks to offer basic accounts, and allowing correspondent banking are useful in fostering inclusion. Since I’ve written that anti-money laundering laws are ineffective at fighting crime while putting costly burdens on those with low incomes, I’m glad to see the IMF has reached the same conclusion. And here’s a chart from the IMF study showing how poor people are less likely to have accounts at financial institutions. By the way, the World Bank has produced some very good research on how the poor are hurt by inane anti-money laundering rules. So kudos to some international bureaucracies for at least being sensible on that issue. But speaking of international bureaucracies, I started this column by joking about the contest to see which one produced the worst research with the worst recommendations. And while the IMF’s new inequality study definitely deserves to be mocked, I must say that it’s not nearly as bad as the drivel that was published by the OECD. So our friends in Paris can rest on their laurels, confident that they do the best job of squandering American tax dollars. P.S. Since I pointed out that the IMF inadvertently ratified one of the key tenets of supply-side economics, let’s remember that the IMF also confirmed one of the key reasons to oppose a value-added tax. One cannot use averages when talking about inequality. Obviously, if a statist government increases inequality, growth will slow, because the burden of government is a precursor to slower growth. Conversely, in an open and free economy, you get higher growth. The inequality in this case is a result of growth. Within the high growth environment, some sectors grow faster than others. Profit levels signal where to reallocate resources from slow growth areas to faster growth areas for the best overall results. In attempting to equalize outcomes in a free market, liberals must take resources from high growth projects and reallocate them to slow growth or no growth projects. Slowing growth should not be a surprise, but rather a predictable outcome. high sounding talk of income inequality is repackaged envy, jealousy and coveting other people’s stuff. Or pandering to those who indulge in envy, jealousy and covetousness. These used to be rejected as ugly and dangerous. Now people have managed to take the high ground with this gross immorality. There is an obvious and very pleasant way to increase prosperity and economic growth. Countries that have more spending on vacations are generally wealthier than countries spending less. We infer that there is a double effect. The extra spending supports more jobs, and the relaxation from work supercharges productivity when not on vacation. A simple Vacation Mandate would place the US and any other conforming country higher along the Vacation – Prosperity curve. It is a wonderful way to enjoy life while increasing financial well-being. The government should immediately require all employers to award more vacation time and the government should make loans available to increase vacation spending. Whatever your doubts, you can’t argue with a graph on paper showing these past relationships. 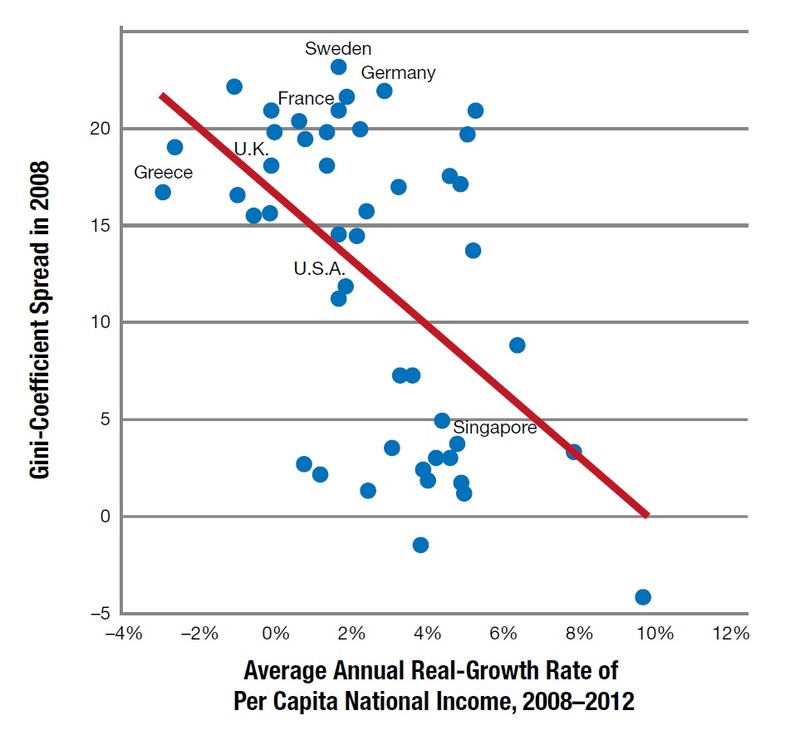 Less work need not mean less income, and these graphs prove it. We at The Institute are quite happy with our generous vacations, and have worked hard to show that everyone should have more of them. Slogan: Vacation to greater prosperity, or stagnate in austerity. (Yes, sarcasm. But it isn’t funny that this sarcasm uses the same logic and similar types of correlation as used in the IMF study. I’ll put that on top of my list of phrases that distinguish libertarians from (reasonable) statists. Most radical differences in ideology stem from different quantitative assessments of situations, not qualitative differences. Placing a little more value on equality vs growth leads to completely different ideological outcome than placing equality over growth (and thus long term prosperity). But that is exactly the challenge of the voter lemming: Equality is finite but immediate, while growth is exponentially infinite, but takes a few years to compound. Equality is finite because it is almost a one-time redistribution in a low growth environment. Growth is exponential, it compounds, perpetually, into infinity. Eventually, you are better off being on the low end of a high growth nation than the middle sheep of a low growth nation. But you have to live with the fact that others next to you have more. You have to learn to love the guy in the mansion at the end of your cul-de-sac. And the more statism you have the more likely he made his money in resentful ways and the more you will hate him – the vicious cycle closes. But if you chose equality, then you must also live with other nations pulling further and further away from you, tha perpetuity of an ever diverging prosperity destiny. Eventually your international divergence depresses every person in your country (not equally either) and makes you cry uncle. It’s not a matter of if, but when you eventually cry uncle. It’s a matter of how much bottom you have to hit as a nation before you finally change course. Change deep inside that is, not replace red statists with black ones, blue ones or green ones and vice versa. Economic slowdown triggers requests for ever more redistribution and ever greater resentment of the rich. The vicious cycle closes. Looks like you entered such cycle in 2008 dear Americans. Now it will become increasingly difficult to escape it after each successive iteration. Based on historical evidence, I give Americans a very slim chance of escaping this fate. So those of you smarter can certainly enjoy reading Mr. Mitchell’s posts but in practical terms you should make longer term contingency plans – or at least have your kids make them. P.P.P.P.S. Statism is a resilient myth. Almost by Darwinian definition, it too must organically and spontaneously adapt its message to the mind of the average voter-lemming — lest it perishes from the ideological universe. P.P.P.P.P.S. The IMF is now also been increasingly hijacked by a majority of European statist nations. IMF is starting to lead the train of decline nations,… few will escape,… but some will… and will create the new successful branch of avant-garde human prosperity. Which train is America on?